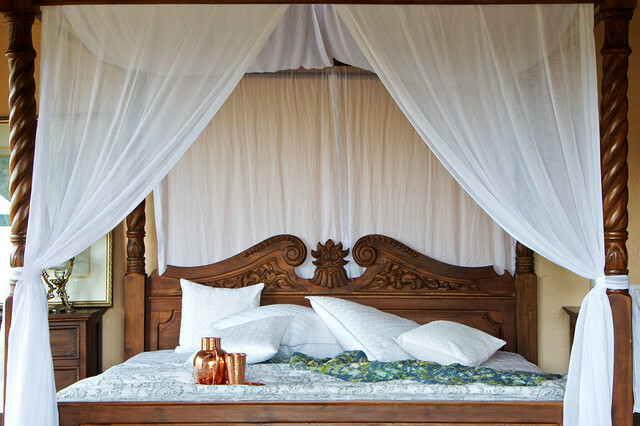 Treat yourself to a four-poster Let’s start with the basics – the bed. What better way to begin the five-star experience than with this classical bed style. Whether you opt for a contemporary slim post, or go all out with a traditional solid carved one – nothing says glamorous better than a four-poster, especially if you choose one with a canopy. Tip: Drape the bed posts in soft fabrics to bring in the romance and create a cosy mood. 5. Canopy bedJust like a four-poster bed, a canopy bed also has four posts at its corners but this one also includes cross beams at the top joining the posts. A wispy fabric is draped over the cross beams that covers the bed on all sides. Light fabrics such as muslin, net or chiffon are often used to create a canopy. 2. Inspired by four-poster designs of days gone by, with twisted posts and ornate, intricately carved headboards, this classic bed sings grandeur. The sheer curtains in white introduce a sense of enclosure and bring a romantic vibe to this space. They also give subtle relief from the heavy woodwork.